How awesome are all of these items... seriously? I want them all and I want them all now! (please take note santa). I've always seemed to love anything that looks like its made for witches or a bit spooky and the obvious, anything with a pentacle sign on it. Empty Casket stocks a wide range of jewellery from your chokers, to your sterling silver items, crystals and more. They also stock accessories now such as these gorgeous trinket boxes (top left hand corner) which are so handy to store all your favourite little pieces of jewellery, crystals etc. they also stock some really cool looking dream catches and many more items that you'll be lusting after. 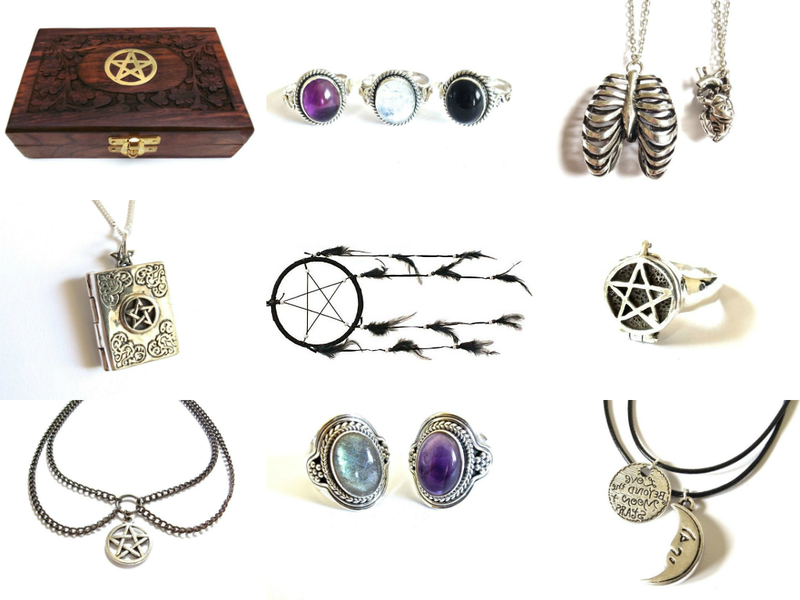 I do think that the little book of shadows necklace and the Cordella gemstone rings have to be my favourite jewellery items from the Empty Casket range and they've definitely been added to the top of my to buy list, which seems to be never ending. So there we have my Empty Casket wish list. I'd love to hear which items you like? I have never heard of this brand- looks so lovely! Such lovely jewellery. I love bits that are feminine without being too girly!